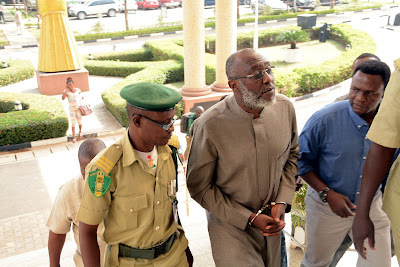 “This development which expectedly elicited widespread public outcry clearly betrays an extra-judicial, top political witch-hunt policy of the APC, carefully designed to humiliate, embarrass and portray PDP leaders as common criminals and set the stage to cow and decimate opposition and perceived foes of the government”. Is this an attempt to sway the court and ambush the judicial process against our National Publicity Secretary, all because of his stance against observed ineptitude and dictatorial tendencies of this administration? The PDP invites all Nigerians and the international community to note the emerging barefaced abuse of state power and violation of constitutional provisions regarding the arrest, detention and eventual arraignment of our spokesperson. For now, the target of the on-going lopsided war against corruption is the PDP and its leaders. All APC members, including those with known corruption issues are immune from investigation, arrest and prosecution. However, more worrisome is the fact that institutions of government, especially security and corrective agencies have now fallen victims of dictatorial abuses. Our fear now is that in no time, ordinary citizens of Nigerians, who in the last 16 years have lived under the rule of law and constitutionally guaranteed personal liberty, would begin to suffer brutality and oppression. Under PDP administration, some Nigerians, including APC leader and former Governor of Lagos State, Asiwaju Ahmed Tinubu were tried but never humiliated; now we see security operatives under this regime being used to crush and humiliate the opposition. Finally, while we study the bail conditions, we urge all PDP members to remain calm, united, focused and continue to pray for the nation and her people. We also urge the media to remain on the side of justice, fairness and rule of law and resist the pressure of being used as a tool to promote arbitrariness and abuse of process in the so-called fight against corruption.